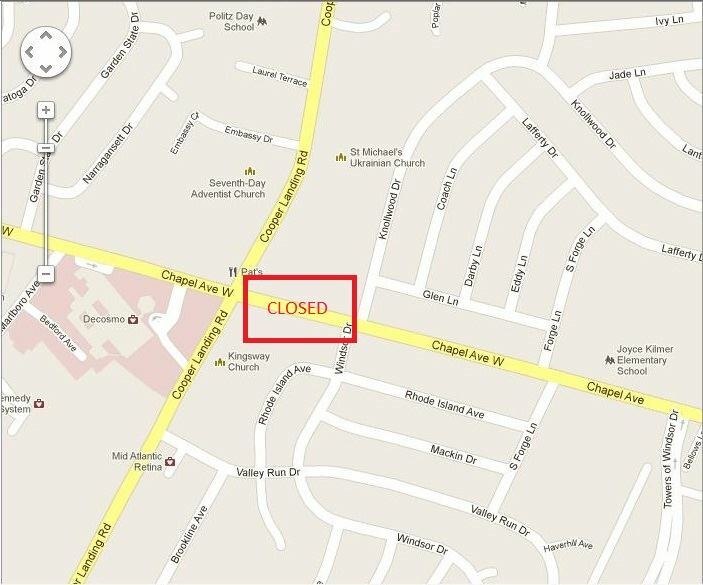 Due to a water main break, Chapel Avenue is closed to all traffic between Cooper Landing Road and Knollwood Drive. Cherry Hill Police anticipate this closure could last up to 12 hours. Please seek an alternate route and expect delays when travelling in this area. Due to a water main break Chapel Avenue between Cooper Landing Road and Knollwood Drive is closed to all traffic. Cherry Hill Police anticipate this closure could last up to twelve hours. Please seek an alternate route and expect delays when travelling in this area.